A playground merry-go-round has a mass of 120 kg and a radius of 1.80 m and it is rotating with an angular velocity of 0.500 rev/s. What is its angular velocity after a 22.0-kg child gets onto it by grabbing its outer edge? The child is initially at rest. This is College Physics Answers with Shaun Dychko. We have a merry-go-round that's rotating at a angular velocity of 3.1416 radians per second. That's the result of converting half of a revolution per second into radians per second by multiplying by two pi radians in every revolution. Revolutions cancel there leaving us with radians per second. A child is going to go on to the merry-go-round, right on the edge and so the after picture looks like this, the merry-go-round with the child on the edge and the merry-go-round has a certain mass and so does the child. They each contribute a term to the total moment of inertia after the child is on the merry-go-round. So initially the moment of inertia of the system is just that of the merry-go-round, and we have a formula for the moment of inertia of a disk which is mass times its radius squared divided by two. 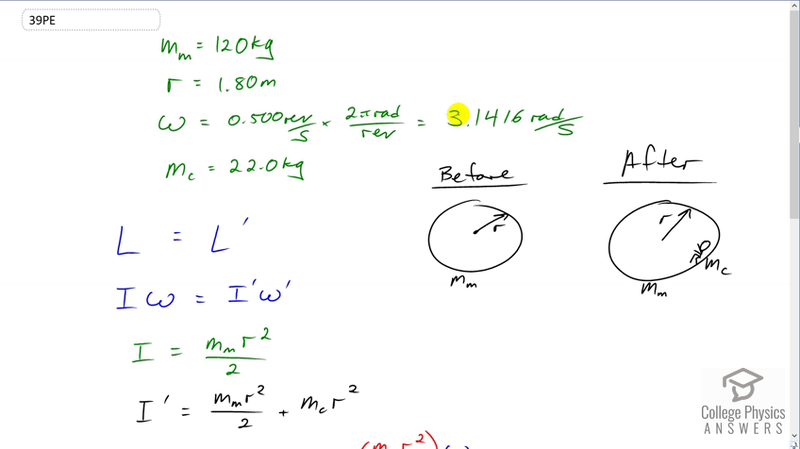 Then after the child is on the merry-go-round, we have a moment of inertia i prime which is that of the disk plus the moment of inertia of the child which we model as a point mass rotating about an axis of rotation a distance r away. So, we have angular momentum is conserved and so that means the moment of inertia multiplied by the angular velocity initially, equals the new moment of inertia multiplied by the new angular velocity after the child goes on the merry-go-round. We can rearrange this to solve for omega prime which is what this question is asking for, what is the angular velocity after the child is on the merry-go-round? We end up with omega prime is i omega over i prime and now we make substitutions for i and for i prime and then plug in numbers. So we have 120 kilogram mass of the merry-go-round, times 1.8 meter radius squared, divided by two, multiplied by 3.1416 initial angular velocity, that's in radians per second, and divide that by 120 kilograms times 1.8 meters squared over two plus the moment of inertia contribution of the child which is 22 kilograms times 1.8 meters squared. This gives 2.3 radians per second will be the angular velocity after the child is on the merry-go-round. We expected this number to be less than the initial angular velocity since we have increased the moment of inertia by this much.